Sport Nunchaku was developed in late 70’s and 80’s by Marc Brémart (Switzerland), Raphael Schmitz (France) and Malco Lambrecht (Holland). Sensei Smith first trained with Sensei Marc Brémart in 2001 and #sportnunchaku U.K. was established by Sensei Richard Smith in 2005. Firstly under Sensei Marc Brémart of the International Techno Nunchaku Association. Then in January 2010 Sensei Marc Brémart parted from ITNA and asked Sensei Smith to be Vice-President, of a new organisation which was undecided at the time to be INA or NIA. Today known as Nunchaku International Academy (NIA) a well organised martial arts organisation and has affiliations in Switzerland, Great Britain, Italy, Chillie and Spain. Sensei Smith is the Vice-president on NIA, Founder and Technical director of #sportnuchaku uk. His key role within this great organisation, is to promote and develop #sportnunchaku for all. This martial art style spread throughout Europe and America and now just like other Martial Arts is practised all over the world. On June 9th 2007 Sensei Smith was fortunate enough to host the European #sportnunchaku championships. The day was a great success and Britain came away with 8 medals. In March 2008, Sensei took 10 students to the World Nunchaku Championships in Switzerland. Over 300 students from all around the World took part including: Switzerland, Hungary, France, Portugal, Holland, USA, Africa and of course Great Britain. Great Britain brought home 1 gold medal and 1 bronze. In December 2009 another team of 11 trained by Sensei Smith, competed at the European Championships, gaining 5 Medals, 1 gold, 3 Silver and 1 Bronze. 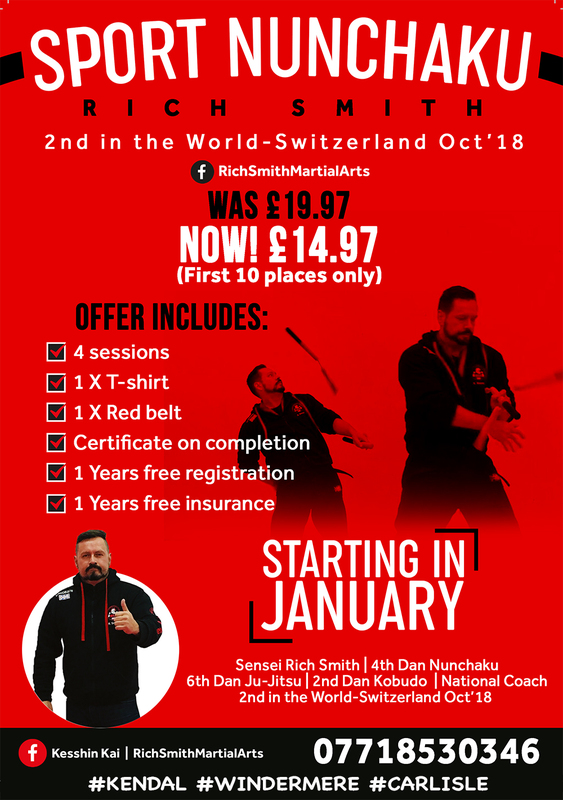 Sensei Smith -National Coach is currently ranked 2nd in the World (2015) and 1st in Great Britain, he is also the first British competitor in 50 years to gain a Freestyle medal in Europe, ranked Bronze 2014. He has also Hosted the World Nunchaku Championships in Kendal, on 22nd -23rd May 2010. A team of 5 went to compete in the World Championships in Switzerland, May 2014. Daniel Charnley returned home victorious with a Silver medal, in his age category, whilst the rest of the team came back with an assortment of medals and placings. In 2015 Sensei Smith 4th Dan Nunchaku hosted the World Nunchaku Championships here in Kendal, on 20th-21st June. We took 16 medals including Sensei Smith became World Kobudo Champion, National Ju-Jitsu Ground Fighting Champion and Silver medalist Nunchaku Combat Fighter. More recently Sensei Smith trained a National Team for the World Nunchaku Championships in Switzerland, March 2016. Team G.B. Brought back 9 medals including World Champion Fred Audin in both Sport Nunchaku Combat & Sport Nunchaku Freestyle. New to the team this year is Rohan Greenslade (Windermere)-Bronze freestyle, Joel Emerson (Kendal) Silver Freestyle, Peter C’ailceta (Liverpool) Bronze Freestyle, Mia Graham (Liverpool) Silver Combat & Bronze Freestyle, Jodie Cline (Liverpool) 4th Place Freestyle, Ethan C’ailceta (Liverpool) 4th Place Freestyle.What an amazing week. Sensei Smith is now busy working on the New Team G.B. for the next championships which will be for 10 days in Paris 2017. A kata is when you perform basic nunchaku techniques arranged in dance like moves, as fluently and perfectly as possible. These techniques are aimed at an imaginary opponent. The purpose of a kata is to get a better understanding of the techniques. Studying a kata does not only mean learning the techniques, but also how to properly perform a technique. Many of the katas we practice originate from French and Dutch styles of Nunchaku. Freestyle nunchaku is a more visually stunning, rather than combative way. Freestyle Nunchaku competitions are now held throughout the year, marks are awarded based upon visual display. 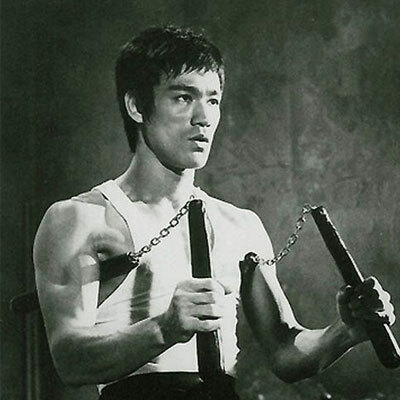 Nunchaku application is all about manipulating the nunchaku. It is used to perform blocks, locks, throws and take down techniques on another person. As you advance up the syllabus the techniques like any other style of martial art become more complicated. Also within sport nunchaku is the sport of ‘Combat Nunchaku’. This is another competitive side to the art. Two competitors stand and fight opposite each other wearing safety protective helmets and groin guards. There are competitions all over the world, including the World Nunchaku Championships in Vevey, Switzerland in March 2008. Tricks or feestyle are also performed on each belt, the higher the belt the more difficult the trick or routine. Children particularly enjoy learning tricks because it builds confidence, promotes expression and most of all is FUN! 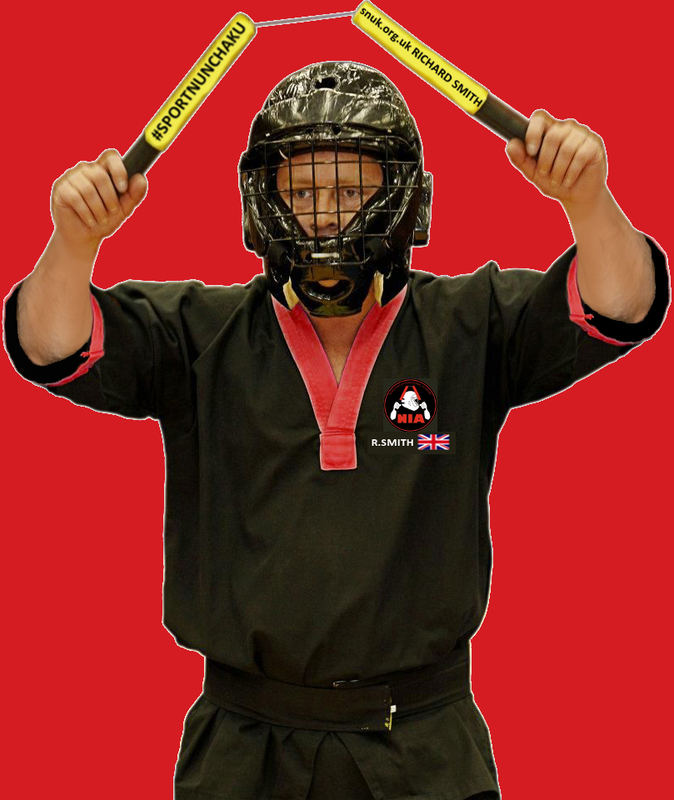 Sport Nunchaku U.K is always open to any sponsorship or funding. If you are a business and would like to advertise with us, either on our Club Uniforms, at our Regional, National or International Events, on our demonstrations DVD’s or our website,please don’t hesitate to contact us. Register now for our Special Offer. 07718530346 to book your place.